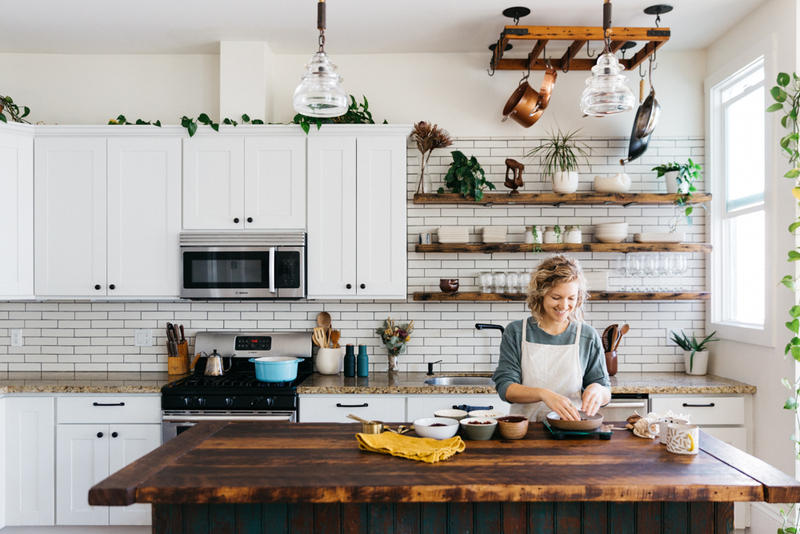 For natural chef and holistic nutritionist, Rachael Gorjestani, there’s no denying the connection between how we feel and what we consume (beyond the plate too). Which is why Rachael is big on adaptogens and their immune-boosting, stress-reducing qualities. In Prep School’s Adaptogen 101 workshop, Rachael shared the health benefits of adaptogens and how to use them in your every day. Rachael is an inspiration in the wellness community and is embarking on an exciting adventure launching Goldmine adaptogens. She shares more about her wellness journey, what’s to come from Goldmine, and her tasty golden mylk latte recipe at the end. How would you describe your wellness journey? As I was introduced to each of these aspects of health, I was driven to go deeper and learn more. My personal wellness journey was met with a lot of resistance at the beginning. I partied in my early 20’s and it took years for me to acknowledge what actually made me feel good, clear headed, and energized. And, frankly, it took some time to be comfortable with pushing against societal norms. In 2012 I lived and worked at a macrobiotic school on the East Coast. Macrobiotics is a holistic approach to eating and living, focused on a Japanese style diet paired with Chinese philosophy. During this time, I learned to really feel the connection between body, diet, and mental health. It was revolutionary to the way I thought about life and how I wanted to live it. It was also eye opening in terms of cooking because many of the ingredients I was introduced to then are now dear to my heart (like miso and umeboshi plums to name just a few). From there, I continued my wellness journey with teaching yoga and later getting trained as a nutritionist. From the beginning, my desire to help others navigate their illnesses or allergies through food was a constant theme. What was the genesis of The Cupboard? While studying to be a nutritionist, I started seeing people as case studies for school. I enjoyed it a lot, but I had a hard time motivating them to get into the kitchen to cook. I felt that I was failing them. That’s when it occurred to me that maybe I should be cooking the food that I was telling people to eat. My mission with The Cupboard is to share organic, whole ingredient dishes, that are deeply nourishing. And, that through this nutrient dense food, I am hope to enrich someone’s life, boost their overall health and wellness (and their kids too!). It’s been close to 3 years since I started cooking for families and it feels wonderful to be supporting my clients through clean and wholesome meals. What about Goldmine Adaptogens? How did that come about? I learned about adaptogens while in school for nutrition. We didn’t learn much, just that there was a category of herbs that helped the body cope with stress. I was instantly intrigued. Like, what?! How are we not all taking these stress reducing herbs? I was also coping with adrenal fatigue, brain fog, exhaustion, and just poor mental capacity. Taking adaptogens really helped to wake up my body and mind, making me feel more energized. In the beginning, I started brewing my own tea, taking tinctures, and exploring the adaptogen arena. That’s when the idea for Goldmine sprang up. It was initially focusing on ready to drink teas using adaptogen ingredients and a little honey. Once i knew I wanted to have this product out in the world, I reached out to my friend, Tina Hardison, to come on board and create the brand from the ground up. I love having a co-founder who’s all about adaptogens and cares about how we communicate their benefits to our audience. Although we’ve launched with our adaptogen powder, the tea is still in the works and we hope to launch that line in the coming year! What are some of the top health benefits of implementing adaptogens into your daily routine? Adaptogens greatly benefit the adrenals which play a vital role in homeostasis in the body. As a result, when taken daily, adaptogens help to boost energy, immune support, mental clarity, curb the negative effects of stress, and help promote an overall sense of calm. The biggest impact of adaptogens is perhaps the most subtle: suddenly, situations that were once triggering or overwhelming, are not anymore. Tina and I hear these stories so often with Goldmine. Since there are so many kinds and forms, what are your tips for beginners who want to try adaptogens but aren’t sure where to start? For me, when trying something new, it’s important that if fits into my routine. So for some folk, it may be taking a high quality capsule form of an herb, and for others it might be a powder they add into their morning beverage. Make it easy! Make it something that can be done daily. For beginners, I suggest asking the question of what you’re wanting out of the adaptogens? Is it mental clarity, immune support, better sleep, relief from anxiety? On our site we have a simple breakdown of the herbs in our formula with the benefits of each herb. When in doubt, seek advice from an acupuncturist or herbals practitioner. People seem to be more stressed and anxious than ever. What lifestyle changes do you recommend to help cope with everyday stress? Getting Space: Setting time aside for mental space is so important! However it happens, it might look different for everyone, but this time helps us process our feelings, thoughts, and current circumstances. Sleep: prioritizing sleep when you can. Taking herbs to support good quality sleep. Checking in with yourself: making sure that how you’re filling your time aligns with your values and larger goals. Drink water, pull up our blinds to see the trees in our backyard, and spend a little time with my husband before we start our day. Leftovers! I like savory lunch like items for breakfast which includes greens, vegetables, a whole grain, and I’ll throw an egg on it or smoked salmon. Cooking! Sunday is day one of my meal delivery prep, so I’m in the kitchen all day. If I finish early, I’ll try and make an evening yoga class. Place all the spices in a medium saucepan with the coconut milk and water. Heat over medium flame for 20 minutes (if using powder ingredients, you only need to simmer for 10-15 minutes). If the tea begins to rapidly boil, turn down to a simmer. Strain into two mugs, add honey and stir. **If using powdered ingredients, you do not need to strain.